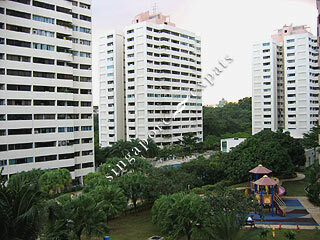 Pine Grove is located in the residential district in Mount Sinai, Holland Road. It has a large compound consisting of high rise apartments and low rise maisonettes. It is a short drive from Pine Grove to the Holland Village and about 10 minutes to Orchard Road. Local wet market is also at the close by Ghim Moh Road. Nice and quiet neighbourhood with good facilities and good schools nearby. Wonderful place to stay.